You may already have benefited from Digital Web World’s marketing services that have transformed your website and rebranded your company but you still have difficulty with copywriting. After all you’re a business person. Now you need a creative copywriter to write sparkling copy that makes you stand out from your competitors. What’s a copywriter, you may ask, and why do I need one? A copywriter writes and edits text, writing for the web so that google finds your company and ranks you highly in its searches. Everyone can write but not everyone can write well and not everyone can write SEO content for the internet. It’s very important that the copywriting is optimised for the web to help Google and Bing find you. Their search engines then drive traffic to high-ranking sites which you convert into customers. Using the right keywords in the copy will ensure relevant searches by people keen to buy your products and services. 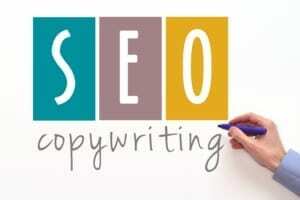 At Digital Web World all our copy is SEO content writing which means it’s written specifically for the internet. We will help you put in place a Search Engine Optimisation (SEO) plan that will include high-ranking, clear, concise copy. Good content goes hand in hand with advertising like pay per click and is all part of the bespoke marketing package that Digital Web World can offer you to transform your business. Copy provides information to potential customers about your business, making copywriting an important part of your commercial strategy. A weekly blog informs clients about your sector, experience, why you are the best and how you can help them. It keeps your website content fresh and Google and Bing happy. Google looks for authoritative websites that provide accurate information updated regularly with fresh content to rank at the top of its searches. Web content that explains your business in plain English and demonstrates you are an expert in your field. Regular blogs that keep your website fresh and optimised for the internet so you rank highly in text and voice searches. Social media to build a following and turn prospects, leads and referrals into clients and customers. Press releases to take your business to the next level, helping you attract media attention and win awards. You are a business person, not a creative copywriter skilled in writing for the web, words may not be your forte. Why not ask Digital Web World to help you write the content for your website? We helped you rebrand, redesigned your website, took your SEO to another level and we know your business well. And we can check your analytics to see which pages of your website are getting the most hits. We will then use this data to generate more popular and relevant content. If you like the web content, you can then recruit us to write that weekly blog for you. Why? Because it will answer frequently asked questions. A regular blog will inform clients about what you do, how you do it and why your business matters. You don’t have time to write a blog every week but the team at Digital Web World do. Social media is a great tool for engaging clients and extending your reach. It tells you which blogs are attracting the most comments, retweets, likes or favourites and shares helping you understand your customer base and their priorities.